Overall, the trousers in my closet are probably the weakest category of clothing. In the past, I have not seen them as exciting to buy as a sport coat or a tie. For the last couple of years, my collection has surrounded two core pairs – a light grey pair and a medium grey pair in sharkskin. I like the texture and colour variation. Following a similar learning and acquisition pattern to my expanding sport coat collection, I’ve recently become acutely aware of the benefits of a seasonal rotation. I put some effort in last fall, and made some seasonal purchases. Now I’m looking at my warm-weather options, and realizing I don’t have much. This is a bit of a challenge considering most of my outfits are centred around sport coats and not suits. I wish I could have my wardrobe organized by season – I’d have a number of options for cool weather, and three for warm weather. So, I organize from left to right based on darkness, and grouped by colour. I’ve outlined the order they hang in the bullet-points above. I use these hangers that clamp onto the hem, and have a rubber grip to prevent slippage. I’m not sure if this is against any #menswear rules, but it lets them hang at full length, and it makes it easy to give them a quick steam to get rid of any wrinkles that hadn’t fallen out on their own. I don’t even need to take them off the hanger! Sometime soon I will be preparing my Fall/Winter stuff for storage, which means I will have to face the limited Spring/Summer options I have. This will involve a steam, a press and hanging the trousers on a more traditional hanger, and putting away in a garment bag. As mentioned, my Sping/Summer is lacking. 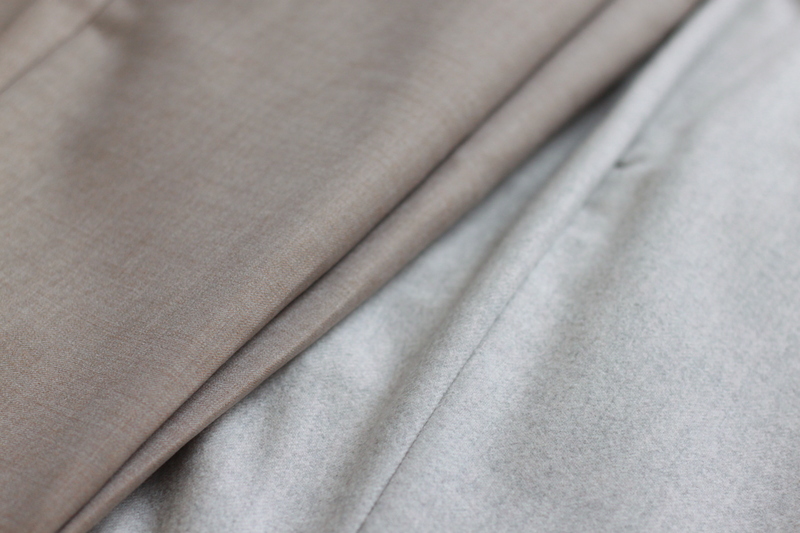 The only true dedicated pair I have is my new cotton-linen blend – a beautiful fabric from Sondrio – made up by Spier & Mackay. The cream colour is perfect. Not too yellow, just a warm beige. I wrote about them in my Spring/Summer wants post, and bought them very soon after writing. I had originally got both the cream and the off-white, but decided that one pair would do. Now, I’m not so sure. I think the off-white is a great colour for warm weather. Wearing the trousers for the first time, I am quite impressed with the fabric. They don’t wrinkle too much, considering the composition. They are breathable, and they drape really well. A light blue would be a great option; not too powdery blue, and not overly saturated. Sadly, that’s not available. I’d also like a sage green pair. For Fall/Winter I have a few pairs of flannels – light brown (cream), camel (tan) and burgundy. Maybe this year I will add at least one pair of grey flannels, though a light grey, mid grey and charcoal would be ideal. 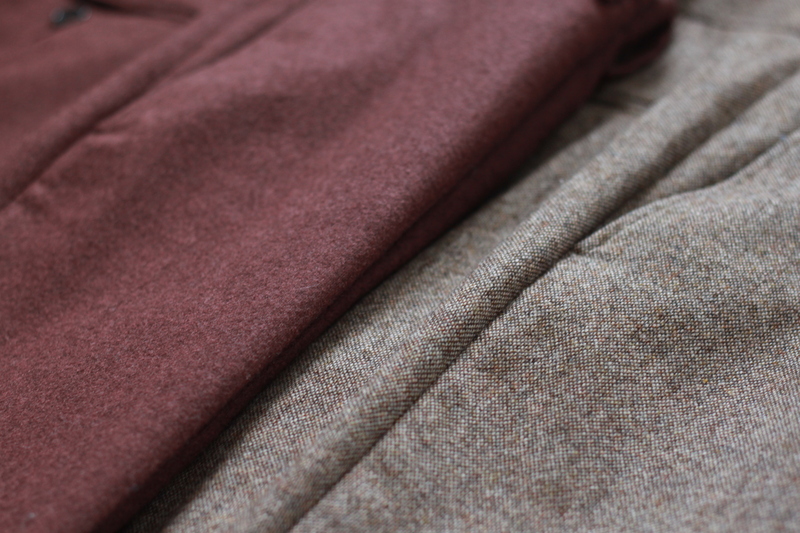 A surprising standout for me from last year was the merino tweed from Abraham Moon & Sons that Spier & Mackay offered. I picked up the light brown, which is a medium brown to me. I shouldn’t have slept on the grey. The last pair is a brushed wool navy houndstooth fabric. Purchased before I truly understood the difficulty ascribed to pairing navy trousers, I was enamored with the softness and pattern of the pants. Every now and then I force myself to wear them, but I always feel a little bit like it’s never the ideal choice. 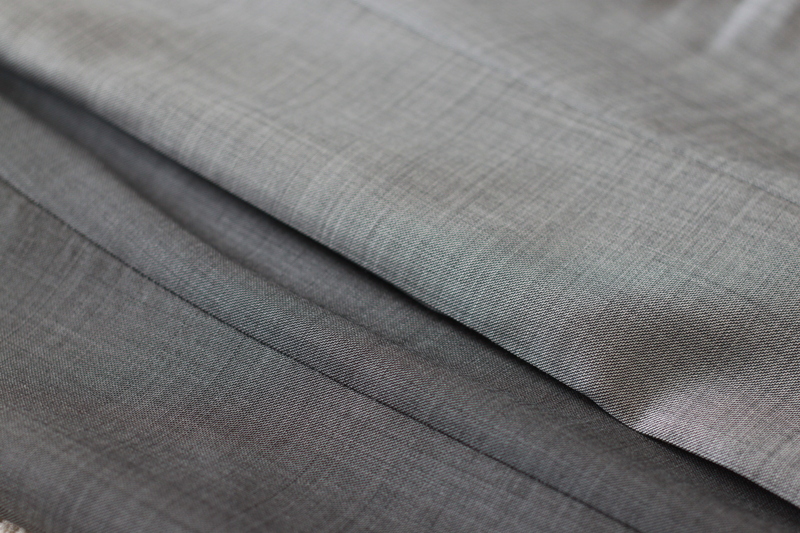 All season wearing pairs in my wardrobe are the two grey sharkskin, and the checked brown. A year or so ago, I’d have said I was against cuffs on trousers. It’s old fashioned, it’s an affected styling choice, it’s… cuffs. Learning about fabric and cut, and how some fabric behaves and drapes, I started to think that maybe there was some sense to this whole cuffing thing. I started to like the images I saw on Instagram and Styleforum. A big influence was @stylejournaldaily and all his awesome shoe shots – that include a nice-sized cuff. So when I bought my burgundy flannels, I decided to jump in with both feet (get it? a pants pun!) and go for 2″ cuffs. Well, turns out I like them. The extra weight helps with drape, and looks great. 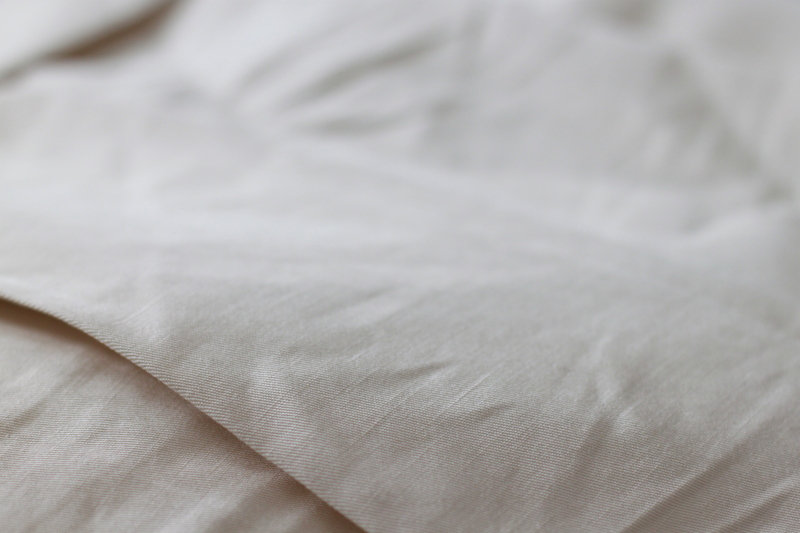 Every pair since that one (tweed, light brown flannel, cream cotton-linen) have had 2″ cuffs. I even took those navy houndstooth ones back to the tailor to be re-hemmed. At this point, half my trousers are cuffed, half are not. A little variety is nice. 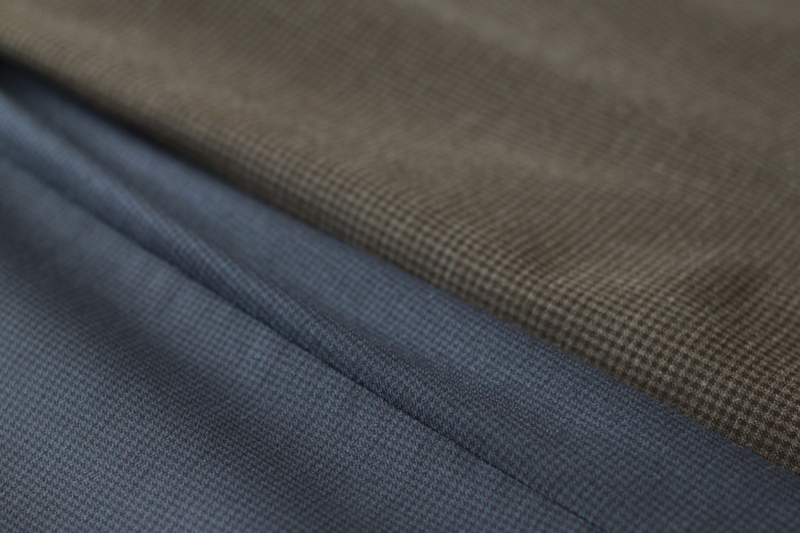 Textured solids are the foundation of my wardrobe, be it sport coats, ties or trousers. I do own a couple of pairs with a pattern; the navy houndstooth, which resolve to a solid from a couple of feet away, and the brown checked pair which have a little more definition to the pattern. Every now and then I may wear the glen plaid trousers from my Spier & Mackay Neapolitan suit with my navy hopsack sport coat. I was drawn to the tweed and the flannels that provide visual interest without being distracting. Looking to the future, I’ve mentioned a couple of wants: Off-white cotton-linen, a light blue, and a sage green. Do you think I’ve missed anything? Let me know!